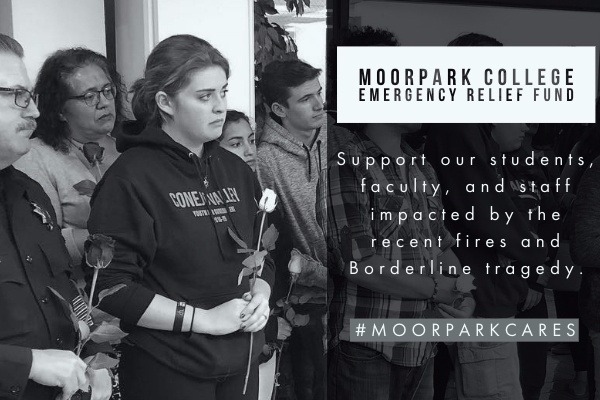 The Moorpark College Foundation has established an Emergency Relief Fund to support our students, faculty, and staff impacted by the recent fires and Borderline tragedy. Funds will assist with expenses related to documented hardship experienced as a result of these tragedies - they will be distributed at the discretion of the Moorpark College Foundation and an application process is forthcoming. Thank you for your support. If you prefer to send a check, please mail to Moorpark College Foundation, 7075 Campus Road Moorpark, California 93021. Please add “Emergency Fund” to the memo line. All donations are tax-deductible. Thank you again for supporting our campus in this time of need.